As published in the Apr/May 2013 issue of SCOPE, the newsletter of the RASC Toronto Centre. Slight reformatting applied. Republished here with permission. So. You've got your camera. You've got your telescope. You have started to shoot images. You're gathering data. Calibrating your monitor. Learning stacking software. Learning about photographic post-processing. On your way to making some pleasing astrophotographs. And you want to share them. With friends and family. With peers and fellow astronomers. Email is too awkward or limiting. What if you want people to comment? You want the astrophotos on a black background! What to do? Where to turn? There are certainly lots of resources available for the general photographer. Perhaps the best known internet-based photo-sharing site is Flickr. Now owned and managed by Yahoo, Flickr offers free and paid accounts. The free account allows 200 images to be accessible at any given moment. They support video as well. Easy to use. There are a variety of organisation tools. Tagging. Convenient options for uploading. A Pro account removes a variety of restrictions as well as advertisements. A two-year term costs $45. All that said, the Flickr system does not allow any control of the interface per se. One cannot change the background colour or style or skin, unlike a blogging tool like Blogger or Wordpress. Only recently did they alter the appearance of the slide show mode to have a black background. For those who are technically inclined and like the idea of having total control, one might exploit or use the free space provided by one's internet service provider. The "big guys" like Sympatico and Rogers provide some space. However, this server space may be very limited. If you have a private ISP, you might have quite a lot of space at your disposal. Still, this may require the use of FTP software to update, and would require some web authoring software to create an elegant, custom interface. And that's getting into the category, quickly, of "reinventing the wheel." I recently heard, through astrophotographer circles, of AstroBin. Visit http://www.astrobin.com/ for more information. This photography website is for astronomers, by astronomers. It is designed from the ground up with astrophotography in mind. For example, it encourages you to provide the technical data for your images, such as the camera and exposure details, filters, etc. It supports image organisation by subject. I.e. you can view images of the Andromeda galaxy shot by many others, as well as your own. Contributors maintain copyright of their images and AstroBin offers theft-protection services. They observe the Finnish Copyright Act which requires proper attribution of the author's name and source. It is meant to be a social place where people may vote and comment on images. It supports all the common image formats, plus animated GIF, and raw camera formats. It is fascinating to note that there are no strict size limits. In fact, they encourage users to upload the full-size images. The coolest thing? Completely, totally, free. 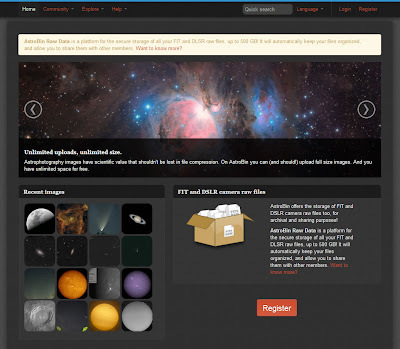 Why not visit AstroBin as a viewer, enjoying the wonderful astrophotographs from imagers around the world. You might see some people you know... If you like what you see and want to contribute and share your own astroimages, register. It's quick and easy. Then, tell us about your online astro gallery!